(CNSNews.com) - The number of people working for the federal government has declined by 13,000 in 2017, according to data released today by the Bureau of Labor Statistics. Meanwhile, the significant increase in manufacturing jobs that started last December halted in September as the nation lost 1,000 jobs in that sector. In December 2016, the federal government employed 2,819,000 people. In September, according to the preliminary numbers released today by BLS, it employed 2,806,000—a decline of 13,000 people employed by the federal government. However, while the federal government workforce has declined by 13,000 this year the total number of people working for government in the United States (including state and local government) has increased by 38,000—rising from 22,299,000 in December 2016 to 22,337,000 in September. State governments added 15,000 workers—with employment at that level of government rising from 5,085,000 in December 2016 to 5,100,000 in September. Local governments added 36,000 workers—with employment in at the local level of government rising from 14,395,000 in December 2016 to 14,431,000 in September. 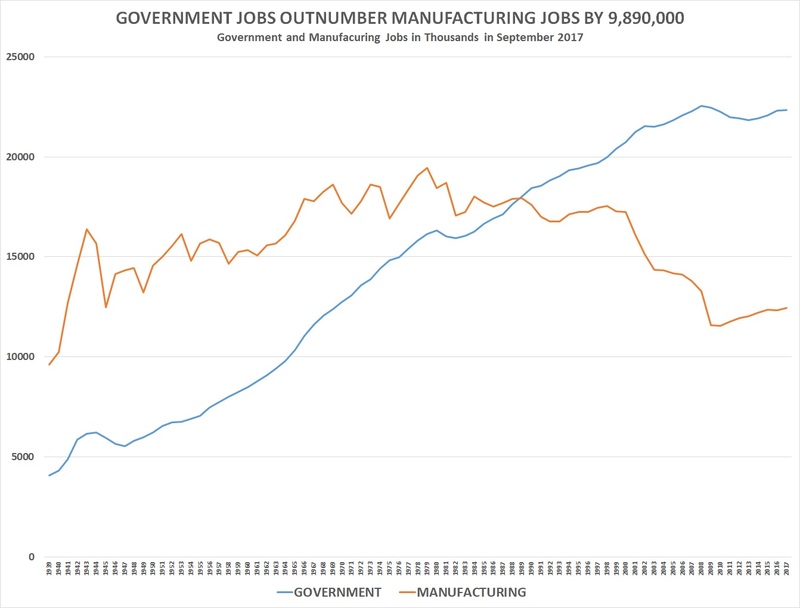 The first time government jobs outnumbered manufacturing jobs in this country was August 1989, prior to that--going back to 1939 (the earliest year for BLS's sector-by-sector employment numbers)--manufacturing jobs had always outnumbered government jobs in this country.